There are those moments in life when we look for something out of the ordinary, a gift that says we really care, or we will never forget you, a legacy that will live on for generations to come. Imagine if that gift could also help to change an impoverished child’s life, to help them break free from the damaging cycle of poverty. By sponsoring an olive tree in Goedgedacht’s Olive Peace Grove you can do just that. 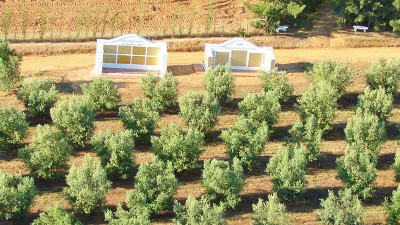 As part of The Goedgedacht Trust’s long term sustainability plan, the organisation began planting olive trees in 1991 and to date has 23 000 trees in its Olive Peace Grove. The olives are processed on the farm into Extra Virgin Olive Oil and table olives, the profits from the sale of our products are used to support the Path Out of Poverty Programme. Your donation of R500 covers the price of the tree and its nurturing for five years, until it becomes fruit bearing. It also includes the charge for scripting a dedication onto a metal plaque and placing it on our Dedication Wall in the Olive Peace Grove. We invite you to dedicate an olive tree to a family relation or friend. Many donors have found this a very meaningful way of honouring someone on a special occasion such as a birthday, a wedding anniversary or an outstanding achievement. You can also choose to dedicate it to a loved one who has passed away, your tree will grow as a living memory to them, and its fruits will continue to be a source of life for others. A few times a year we host a Dedication Service where you will be invited to a lovely service in our Chapel followed by the unveiling of the newest plaques and a lovely lunch. The perfect opportunity to visit us with your friends and family to view your special dedication plaque. Please advise the details of your 16 word dedication in the comments section once you have completed payment, alternatively we will contact you once payment has been received to confirm the wording of your dedication plaque.